Can you believe the weather at the moment? We’re not sure what it’s like where you are, but up here in Manchester we saw temperatures drop, a burst of sleet and hailstones and even a covering of snow descend overnight! Can you imagine that? We definitely wouldn’t blame anyone for thinking that we were still in the middle of winter with the way the climate is treating us, and it really does go to show just how unpredictable the weather can be here in Britain when there’s a blanket of white falling in the middle of April! We don’t envy the lawns that have to deal with these sudden changes, either, as every homeowner and gardener with a green area in their home knows exactly how taxing even the smallest bit of freezing cold weather can play havoc with a natural grass lawn. Artificial grass is the perfect product for any homeowner looking to remove all of the potential stress of worrying about your garden when the weather suddenly decides to make a turn for the worst, as we know it’s very capable of doing, with a tremendously high standard of quality guaranteeing that nothing will be able to get the better of your brand new artificial grass lawn should you choose to invest. Add to that an innovative free draining weave and practically zero maintenance qualities, and it should be obvious as to why so many people choose to make the switch to artificial grass with every month that passes! 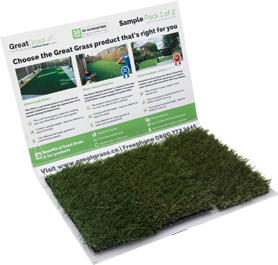 If you’re looking to ensure that the weather never gets the better of you, why not invest in the incredible artificial grass found here with Great Grass? We’ll be more than able to supply and install a gorgeous artificial grass garden that not only resists the worst of the British climate but allows you to relax courtesy of incredibly low maintenance requirements. Make sure you get in contact as soon as you can, as we’re always ready to hear from you.